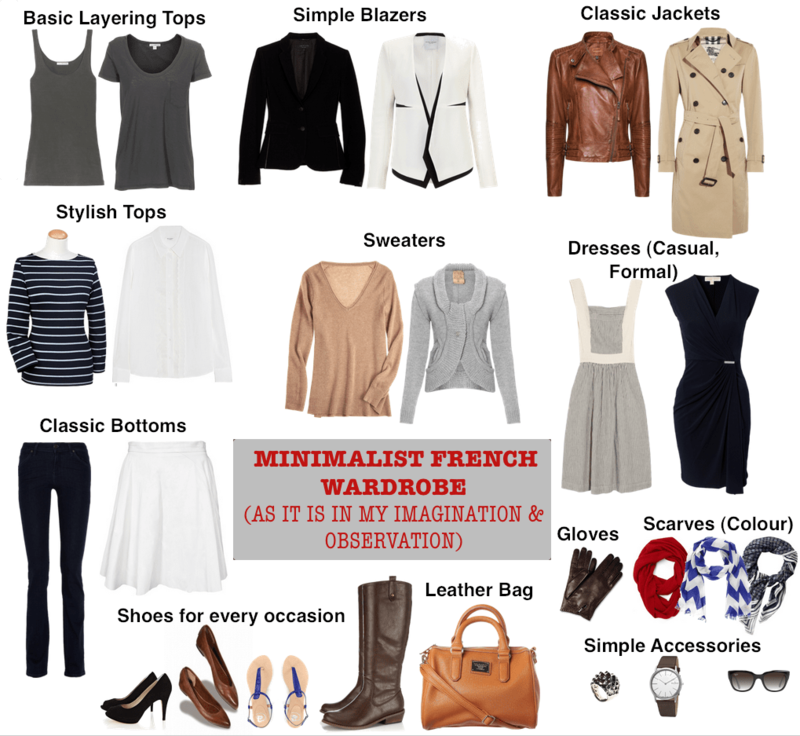 Minimalist French Woman’s Wardrobe (As it is in my Imagination / Observation) | Save. Spend. Splurge. Worn underneath things like button-up white shirts, sweaters, blazers or jackets, basic layering tops tend to be in black, white, khaki green, or grey. Simple, not too tight, and slightly loose for that casual look. I saw them layering with these black or white blazers over those tops but also over striped shirts and white button-up shirts. It looked so effortless and easy. Each blazer I noted was very classic, or had a slight twist to it — a leather detail, a stripe, nothing too frou-frou. Winter is not that cold in France so they don’t have goose down jackets. They have trench coats that they can layer sweaters underneath topped with scarves, and every cool French girl had a nice leather jacket in black, dark grey or brown. Striped Breton tops are still chic and will always be chic in my opinion. I also saw quite a few white button-up tops, like ones from Equipment (which I adore, except now since 2009 they are made in China). They double as Autumn jackets and underneath jackets for Winter layering. Simple colours, cashmere, simple knits. One casual summer dress (you can always dress it up with jewellery), and one formal little black dress (a la Coco Chanel). Jeans. Skinny, bootcut, flared… in a dark rinse. Also, their skirts tend NOT to be tight and short, they are flared and A-Line, all the better to bicycle with. Heels (black to match the black dress but also everything else), ballet flats (standard), sandals for summer and knee-high boots. One stylish, no-name, logo-free bag. Usually leather. They don’t like to show off in their handbag and hardware. No glitz or “glamour”. For when it gets nippy! This is where they let themselves add a bit of colour and texture, if that! I saw lovely scarves on French women even during summer. Another area they let themselves add a little personality to a neutral outfit. Bold rings, bold necklaces, all kept very simple and not overdone. A simple analog watch, a pair of sunglasses on top of their head, and they are ready to go. I think you’re spot on. I lived in Paris for 6 months and what you describe is very much what I observed. Also, Tania is completely right that American women are WAY too done up in terms of makeup. Less is more. I’ve been definitely moving this way. Lots of soft Ts in grey, black or white. A few fitted black dresses and blazers. A few black wedges (but slim cut not clunky), booties and ballet flats. Definitely easier to get dressed this way. I also like that French women aren’t too “done”. Simple hair and very little make-up. Many American women wear way too much make-up. I just touch up here and there to define my brows and make my skin look a little better but a very natural look. If you have a flattering black dress on, great shoes, clean hair and a bare face (with a little red lipstick), it looks quite beautiful. That’s it. That’s my entire colour palette! Oh and as for the makeup piece — I agree. But bare faces, you need to have perfect skin, which I do not.. yet. Since I retired I have much less need for a lot of clothes so almost all of mine trend to the casual side of the scale. I do have the obligatory dress and suit in my closet for wedding and funerals but most things would be considered casual to business casual. Nevertheless, I love clothes and have been following a couple of fashion blogs which have given me some great ideas for creating nice outfits. I have several pairs of pants that I pair with a variety of sweaters and blouses for a myriad of looks. I do have several coats that work really well with those outfits and have found a very simple addition of colored leather gloves that match either the coat or part of the outfit underneath creates a really chic look for not a lot of money. These gloves get switched around just like other pieces of the outfit. My biggest problem is shoes because I have a problem with my foot that eliminates stilettos, and my foot size is wide which eliminates a lot of designers and too often relegates me to “old lady shoes”. Le sigh. Hmm. Maybe there’s a market for wider width heels. Even the higher end brands like Stuart Weitzman aren’t in your arena? I’ve been working on a wardrobe like this for the past several months. I’m going more minimalist with my wardrobe due to both lack of closet space and lack of budget. Fortunately I’ve got many of these items already. This is a great synopsis for novices like me. I tend to overthink most things, including style. Your imaginary French woman is very stylish! I’ve been thinking of mixing up my own wardrobe lately. A lot of clothes fit me too ill to give off that effortless chic (super petite, athletic figure), but the garments themselves are too cheap to warrant a tailoring. Not really looking to buy a whole new capsule, but definitely time to start upgrading a couple pieces, methinks.